This was SO delicious! I made 2 weeks ago and going to be making again tomorrow. Love your recipes, and thanks to them, my Instant Pot is helping making weeknight dinners SO much easier! What a sweet comment. Thanks so much Kristin! Hi Barbara, great recipe I like to serve it with garlic mashed potatoes. Mash the potato with a olive oil based margarine and olive oil and add minced garlic to taste. That does sound delicious. Thanks for sharing Terry! Hello there, I have a whole chicken that’s been thawing in the frig overnight but it’s still mostly frozen. How can I use this recipe worth that whole chicken? 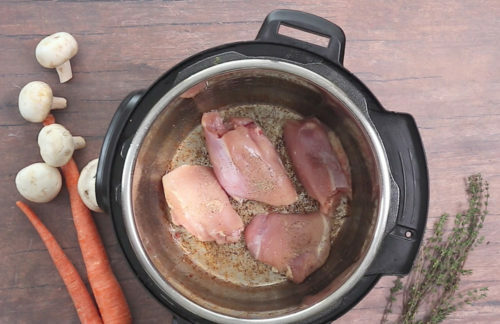 I have seen folks cook a whole chicken in the Instant Pot but not sure how to adapt this recipe. Btw, I’ve made your recipe with bone in chicken thighs months ago… It was the Bomb! So delicious! Can you use chicken thighs with bones? Hi Chris – yes, but you’ll need to increase the cook time. I’d try 15 minutes. Hi, Barbara, another winner! The 10 minutes at pressure is somewhat deceiving, as this recipe is an act of love. I ran out of the 30 minutes my Instant Pot’s Saute Mode suggested before I ever got to coming up to pressure once the thighs returned to the Pot. I liked how all the liquid was reduced to a yummy sauce. Hi Kathryn – so glad you enjoyed it. Be sure your IP says hot before you start to brown and don’t worry too much about browning the chicken completely, as long as you get a nice sear on one side of the chicken and some nice browning on the bottom of the pan so you’ll get plenty of flavor in the sauce, you’re good. 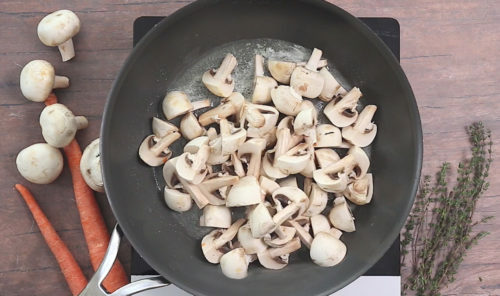 Don’t crowd the pan when browning either, or you’ll steam the chicken instead of browning it. Thanks for taking the time to comment! I love your site, but would it be possible to remove the “read more” and just provide the entire recipe from the get go? Thanks Chris – I’m so glad you’re loving my site. The read more is only on mobile devices, you won’t have to do it on a desktop if you prefer to avoid the extra click. This was so yummy, but we are most of it at dinner ?. Is there any reason I could’nt double the amount of chicken I put in? I had some extra sauce but most of the chicken was eaten by my family of 4. Thanks Carrie! I think you could double the chicken with no problem, and no increase in cooking time. Glad you enjoyed it. This was worth the work. 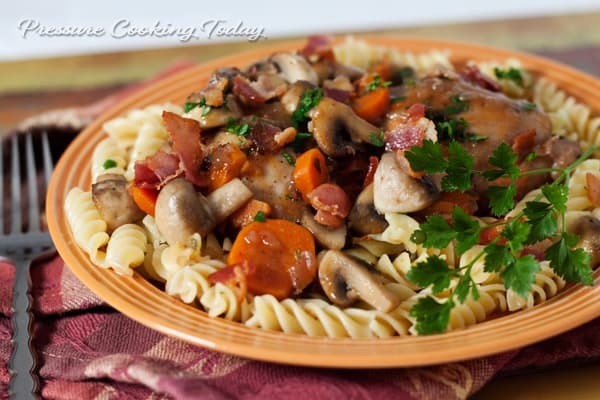 I used chicken breasts and had cubed the chicken, Served with egg noodles – delicious! Thanks Brenda – glad you enjoyed it! This was amazing! It took little bit of time to get it to all to come together but it was worth it. Julia Child eat your heart out. Well maybe not exactly, but it was fun to pretend I was a Chef du cuisine! Hubby loved it too and he has a hard time with my experiments in the kitchen! 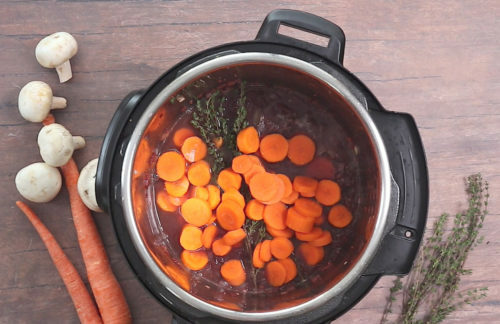 I just received an electric pressure cooker for Christmas and this was the first recipe I tried. It was seriously to die for! The flavor was fantastic and I can’t believe how little time it took. I am now addicted to my cooker and your site. Your recipes and posts are so helpful! Thank you! Thanks Danielle! I’m always so happy when I can help people learn to love pressure cooking. Have fun! Fantastic! What took 3+ hours traditionally was done in under 1 hour-start to plating! Served over rice (made in advance in the pressure cooker) made dinner for 2 (1/2 recipe) and a lunch for under $10. A must add to the recipe list of favorites. Thanks Dave! It’s one of my favorites too. Isn’t it nice when you have a little bit left over for lunch when you enjoyed it so much the night before. Tried this tonight – it is insanely good! Had leftovers for lunch. How could it possibly be better the next day?!?!? Thanks Mary! The older I get the more I love leftovers for lunch too. Trying this tonight! This will be my first time using my new pressure cooker. Fingers crossed. The recipe says 10 minutes at high pressure but does not indicate whether one should use a quick release, natural release or some other release method. Can you please clarify this? Thank you. Hi Dave – I used a quick pressure release. I’ve updated the recipe. Thanks! How sweet of you to have this giveaway. I would love to try your recipe in a new pressure cooker. My pressure cooker and I are dating again. 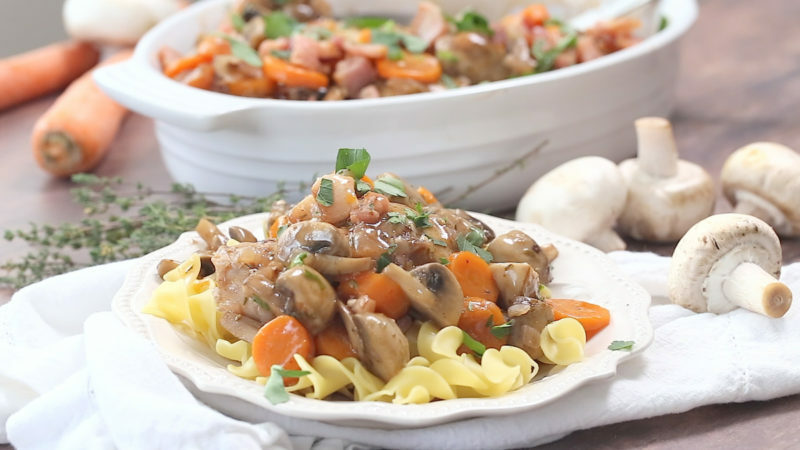 I’ve never made this classic French dish, but I think it’s time to try it out. Pinning, for a cold winter night. I think buttered noodles sounds perfect for us. Thanks. I’ve always wanted to try this recipe! Your food always looks so good! Thanks Rachel! I hope you’ll give it a try. Thanks Em! Not always easy to get a good photo of stew. 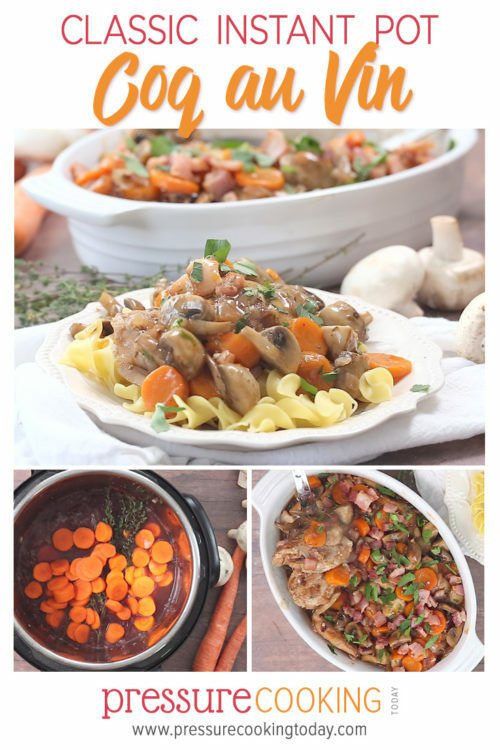 This looks delicious Barbara-I’ve always made Coq Au Vin the regular old way-can’t wait to try it in the pressure cooker. Thanks Carol! Please let me know what you think.